The owners of the Millennium Tower units have suffered no real damage other than bad publicity and are partly responsible for their own troubles, the city of San Francisco alleges in its defense to an owners’ lawsuit. The city is one of many defendants in a legal action filed by dozens of owners of units at the building this summer. 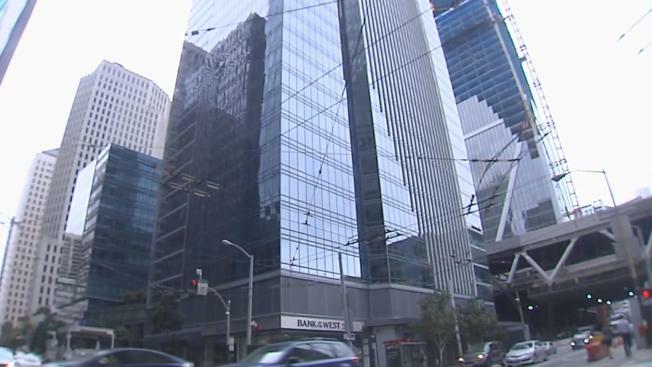 The suit was lodged after it was revealed that the 58-story structure at 301 Mission St. has sunk some 16 inches and is leaning north and west. In a filing earlier this month, attorneys for the city pointed the finger at both the developer of the sinking structure, Millennium Partners, their engineers and architects and the owners of the units themselves. Pat Dodson, the owner of a unit on the 42nd floor of the building, says the city’s filing is just another example of the finger-pointing that has kept anyone from fixing the problem. In a filing lodged by the city last week, the City Attorney’s office argues that that the owners learned about the sinking problem “as least as early as June 2015” but did nothing to address it. The failure to do “everything reasonable possible” to fix the problem at the time, the city contends, legally bars the owners from suing for damages, according to the city’s filing. In a separate argument, the city contends that despite the continued sinking of the building, the owners suffered no actual damage to their units other than "negative public perceptions’’ due to bad publicity. The city also represents the Transbay Joint Powers Authority – the publicly funded agency that has been constructing the next door Transbay terminal project. In the response to litigation, the city suggests that owners should sue the developer, Millennium Partners, for not alerting owners sooner about the sinking condition. Documents show Millennium knew as far back as 2008. The city also suggests that owners should go after Handel Architects and DeSimone Engineers in litigation, since the city enjoys legal immunity. Jerry Dodson, who has filed a separate fraud complaint against Millennium, says the city’s stance is outrageous, given clear evidence that the city officials knew about the problem since 2009 yet failed to alert residents. Dodson disagrees with the city conclusion that there has been no real damage to owners’ units because of the settlement of the building. EDITOR’S NOTE: After our story initially aired we received the following comment from John Coté, a spokesman for the City Attorney’s Office. "A group of Millennium Tower residents sued the city in a situation where they should be looking at the developer of this building. We are not blaming the individual homeowners, but we are obligated to take the necessary legal steps to protect the residents and taxpayers of San Francisco."